As you may have noticed we spent the weekend livin' it up in sunny Knebworth for the rawktastic Sonisphere festival. 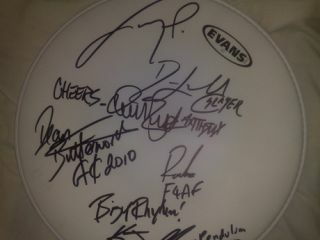 While we were there we bumped in to some drum heavyweights, and got them to sign this rather fetching head, which you can now win. All you have to do to stand a chance of winning the skin (which is signed by Dave Lombardo, KJ Sawka, Tony Palermo, Dean Butterworth, Ryan Richards and Charlie Benante) is answer the question below. Which of these bands did not headline the main stage at Sonisphere 2010? Send your answer to rhythm@futurenet.com by 17:00 on Thursday 5 August to stand a chance of receiving this drumming treat through the post!